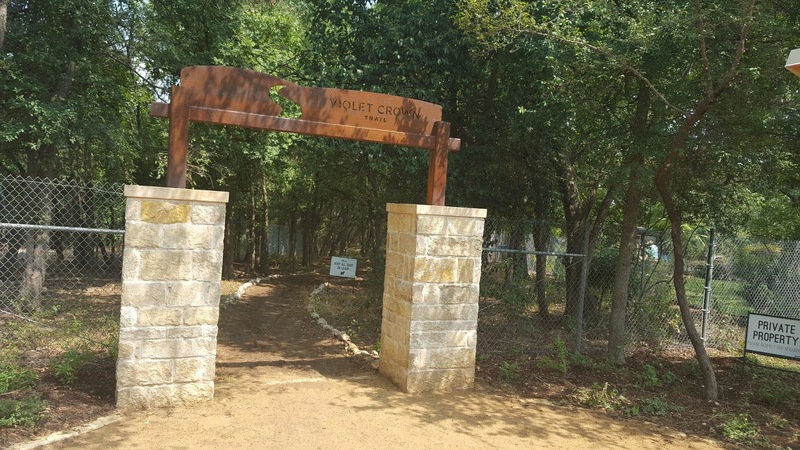 So Linda sent me an article about a new trail opening on August 14th in Austin, The Violet Crown Trail. I decided to go out and give the new trail a try on August 15th. The terrain was similar to Purgatory Creek. There were a lot of rocky limestone sections, but Violet Crown had better surrounding scenery. Lessons learned on this trip: it was already blazing hot outside at around 9:30 AM, and the trail was packed with hikers, walkers, and runners. The Violet Crown Trail (VCT) came to exist in 1999 and required 15 years of land purchases to get the area needed for the project to begin. 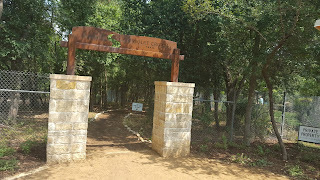 Currently, the first 6-mile section is open out of the total 30-mile trail. 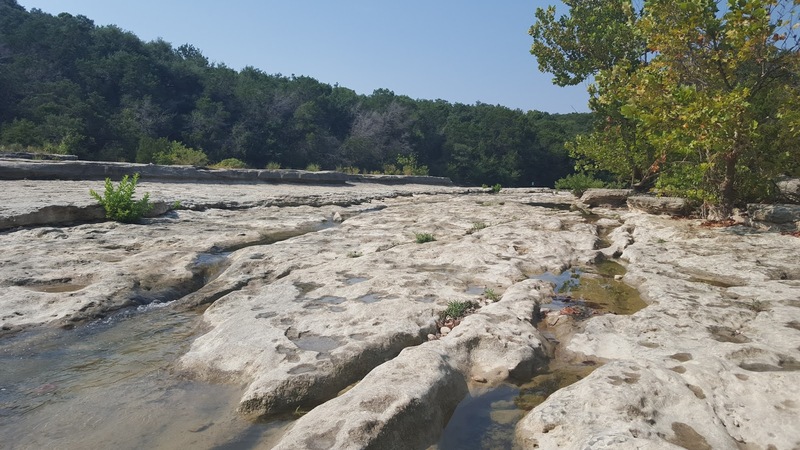 Once complete, the 30-mile trail will be the longest in central Texas. Additionally, the current plan has the Violet Crown Trail running from Zilker Park to Lady Bird Johnson Wildflower Center. The entire trail is estimated to be complete by the end of 2016. To start my trip, there was an event happening in Zilker Park, so it was tricky to navigate to the trailhead. I could see where I needed to, but was forced to weave around by traffic cones. Finally, I parked and was instantly disappointed by how hot it was. Out of the parking lot and at the trailhead, I was met at excitedly by a guy from REI handing out coupons to get people to vote for charity funds to improve the Violet Crown Trail (check out the results here). After a quick talk with REI guy, I started down the trail. The trail alternated between smooth trail and then a lot of rocks. The rocks weren’t too bad, but the trail was packed with people. This made navigating through the maze of rocks a lot more challenging, and even impossible at times. Also, I had some difficulty following the trail signs, which is how I made a detour to a creek early in the ride. Once I was back on track from my detour, I crossed a dry creek bed, which led me to an official detour. This section was true singletrack and ended up being a nice ride for a bit. Once again, I ended up finding a high traffic stretch. This forced me to walk a decent amount, so I wouldn’t accidently run over any hikers on this narrow stretch of trail. What I was slowly learning was the norm, there wasn't a sign stating that the detour was over. Missing an unmarked turn, I road to far and had to fight my way through some brush and across a dry creek to make my way back to the official trail. A little scratched up but back on the main trail, I started on a section that would have been nice to ride. But as always, there was just too much foot traffic to really get going. 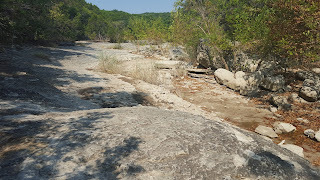 After slowly making it past all the walkers and runner, the trail abruptly ended at a creek bed. Not knowing where to go, I road parallel with the creek, which was the wrong choice. Even worse, a few hikers decided to follow me the wrong way as well, but I successfully played off my error by taking a few photos. The hikers looked disappointed as the turned around and headed back the other way. Finding the actual trail once again, I crossed the creek. There was an easy section of trail, but my progress was slowed once again because of all the foot traffic. After riding for a bit, I found a section of washed out trail and had to detour. With the trail located again, I was riding under the 360 overpass, where there were a few murals painted. A little bit further was a section I couldn’t ride. 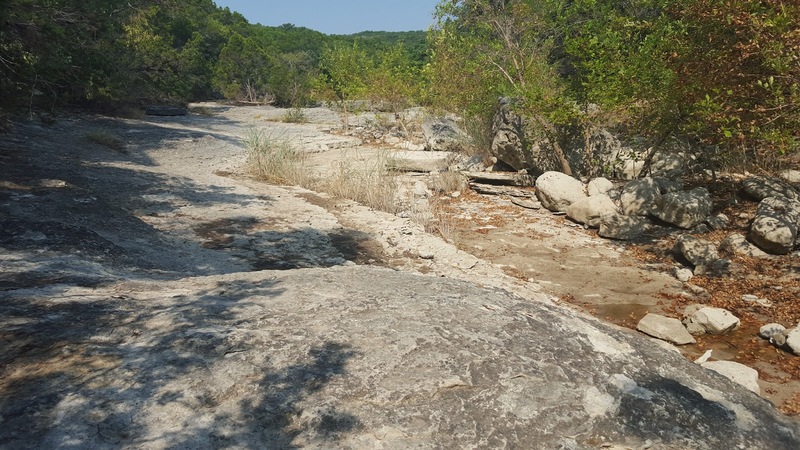 The trail was extremely narrow with huge rocks and a steep drop off into a creek bed. However, I was fine walking here because the scenery was so nice. Along with overlooking a creek, there was a high cliff face as well. By this point, I was almost to the 290 Trailhead and the final section of the VCT was full ups and downs while crossing a ton of dry creek beds. Finally, I was at the end of the trail and it ended with a steep set of switchbacks. I wanted to ride the switchbacks to see how powerful the old legs were, but I was instantly greeted by a hiker and ended up walking instead. After walking a fairly steep hill, I couldn’t ride the narrow path because there were too many hikers. I was excited to finally be at the 290 trailhead after about 2.5 hours. After a short rest, I felt a little defeated because I needed to ride the entire trail back and I was already pretty beat. Thankfully, I had gained a little knowledge of the trail and it only took about an hour to ride back. As I was riding back, I accidently went on a small side quest. I reached a creek bed that didn't have any directions, so I ended up following two hikers. They were apparently just as lost as I was and we ended up an unofficial section of trail. The right choice would have been crossing the dry creek bed, but we ended up paralleling the creek instead. I rode/walked up a mini mountain where the trail mostly ended at the peak. 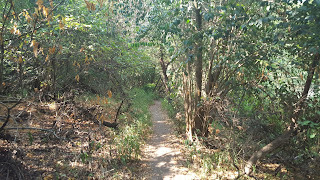 Desperate to keep moving forward, I decided to fight through a barely visible overgrown section of trail. Unfortunately, this ended in a steep, dry gulch. It was pretty tough to scurry down. Thankfully, I eventually made it back to the creek crossing and was back on my way. By this point, I was pretty flustered and considered just having rescuers come save me from the wilderness, but after a few minutes of riding, I was back to feeling mostly positive. I eventually made it back to my car, pounded 32 ounces of water, put the AC on full blast, and headed home. I’m glad I took the time to try the trail out, but I was even happier to be done. From what I’ve seen this trail looks like it will be a lot of fun when completed. However, cycling ended up being extremely difficult for me because of some advanced sections of trail, the amount of people spread out on the trail, and it was difficult staying on the actual trail (not enough signage). In my opinion, you are better off just hiking the trail and leaving the bike at home for the time being. What are your thoughts on the Violet Crown Trail, either current or future project? If you like the blog, go ahead and follow us on Facebook.